Former Archbishop of Canterbury, Lord Carey, writes in an op-ed piece that the hundreds of Britons fighting for foreign terrorist groups such as ISIS in Iraq must have their passports annulled and that Britain should no longer be ashamed about British identity in the name of "multiculturalism." The menacing advance of the ISIS terrorist group, also known as the Islamic State of Iraq and Syria or the Islamic State, in Iraq should not prejudice Western people against Muslim people and the Islamic faith, Lord Carey cautions in his article published in the U.K.'s Daily Mail newspaper Sunday. But there is a darker side, he adds. "Radical Islam is on the rise and imperilling our way of life, threatening to undermine the values that have been bitterly won over the centuries," he said, noting that about 500 of "these murderous thugs, criminals and rapists" are said to be Britons and a further 1,500 from other parts of Europe. 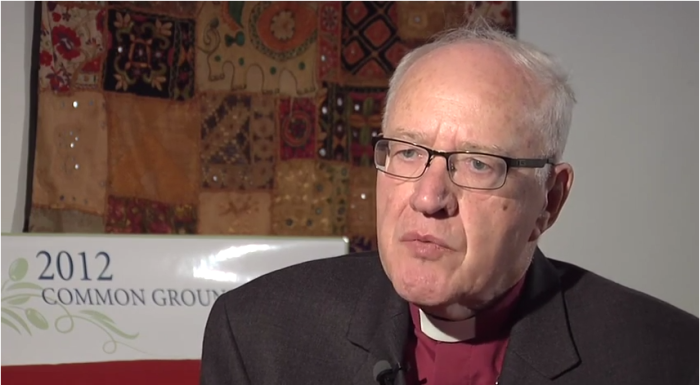 To draw attention to the kind of evil ISIS is doing, the former archbishop quotes his friend, Canon Andrew White, the Vicar of Baghdad, as saying that many of his parishioners have been killed. "He said only the other day that a child he had recently baptised was cut in half by terrorists in the advance of IS. He and other church leaders in Iraq are witnessing the ethnic cleansing and even the genocide of the ancient Christian community in the homeland of our Christian faith." ISIS, which had long been aiming at establishing an Islamic emirate in the Levant region through "jihad," is among the major terrorist groups that are fighting government forces in Syria, and has made significant military gains in Iraq in recent months. ISIS, an al-Qaeda offshoot, has asked minorities in Iraq to flee, convert to Islam, or be killed. The group initially raised money through rich people in the Arab Gulf States of Kuwait, Qatar and Saudi Arabia, which are all U.S. allies, Daily Beast journalist Josh Rogin recently wrote. Christianity in Iraq dates back to the first century and the missionary expansion inspired by the preaching of St Paul, while Islam arrived by conquest and the sword centuries later, writes Carey, who was archbishop from 1991 to 2002. He suggests two measures as a response. The first step is to withdraw their passports, states Lord Carey, whose theological roots are in the Evangelical tradition of the Church of England. "Young people who travel abroad to commit violent 'jihad' should know before they go that there is no way back to civilised society. It may focus their minds to know that the privileges and luxuries of our country (including our gyms, games consoles and relative peacefulness) will be denied to them in future." The majority of British citizens want this to happen, he says. "They will want it out of sheer disgust that so-called Britons are killing others in the name of Islam and so challenging the tolerant values that stem from our Christian heritage." The second step is "to recover a confidence in our own nation's values." "By embracing multiculturalism and the idea that every culture and belief is of equal value we have betrayed our own traditions of welcoming strangers to our shore," he explains, pointing out that "the strangers we welcome were attracted to our way of life and our democratic traditions." In his Easter speech at Downing Street this year, British Prime Minister David Cameron said Britons should be proud of their Christian country. Cameron said he is "proud to be a Christian myself and to have my children at a church school." "I often get my moment of greatest peace – not every week, I'm ashamed to say, but perhaps every other week I pop in to the Thursday morning sung Eucharist beautiful service in St Mary Abbots, and I find a little bit of peace and hopefully a little bit of guidance," he said. "I am proud of the fact we're a Christian country and we shouldn't be ashamed to say so." The British prime minister also said there was a need to expand the role of faith and faith organizations in the country. While the majority of Muslim leaders in the U.K. firmly condemn radicalization of Islam, Carey writes, "the appeal of such illicit underground movements to radicalised young men cannot be underestimated." Muslim communities should cooperate by stating "more clearly than they have done so far" to denounce "these fanatical forms of Islam." It is greatly feared that the ongoing ISIS rampage could incite sectarian violence even as Iraq's new Shiite prime minister, Haider al-Abadi, is striving to form a power-sharing government capable of fighting ISIS militants, and draw Sunnis, who were side-lined by his predecessor Nuri al-Maliki, into politics. Are African Americans Being Recruited by ISIS?